It rained lightly off and on last night but this morning was clear. 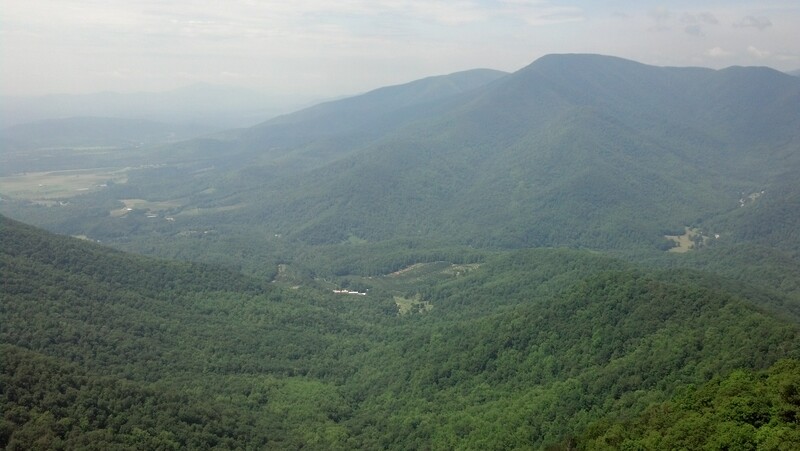 I finished the climb up Three Ridges Mountain and then the rest of the day was fairly level. Hanging Rock Overlook on the way down the mountain had a great view so I stayed there about an hour then got going down to the Maupin Field Shelter for lunch, only to find a note in the register from Stretch that there might be trail magic from Uncle Buck at the next gap. I decided to wait for my lunch and ran down to Reeds Gap. Uncle Buck wasn’t there but Storytime had been to town and left a bunch of sodas as trail magic so I got some of that. Thanks, Storytime! The sun was pretty hot there so I decided to move on a little bit to the Three Ridges Overlook on the Blue Ridge Parkway. I was sitting on the curb to eat and Stretch was standing near the trash can when we heard rustling in the trees across the street. A bunch of motorcycles went by so I couldn’t hear it any more but she suddenly looked very upset and started yelling, “Cop! Cop!” and pointing down the road. I saw a park ranger’s SUV coming but couldn’t figure out why this was a problem since we didn’t appear to be doing anything illegal. The ranger stopped in front of the overlook, blipped his siren, then moved on. When I could hear again, it turned out that Stretch had been yelling “Cub! Cub!” because a tiny bear cub had tumbled out of the woods into the street and she thought the SUV was going to hit it. Its siren scared him back into the woods though and we didn’t see him again. She couldn’t figure out why I hadn’t been at all concerned until I explained that sitting on the curb, my view was blocked and I didn’t even know there was a cub there. We soon came out to Rock Point Overlook, which was different since we were mainly looking at the valley instead of the usual mountainous view. We could see a storm coming across the valley and decided to get moving with our pack covers on. At the next overlook on Cedar Cliffs, we could see it even closer but it appeared to be moving sideways as well so we thought if we waited we might miss it. 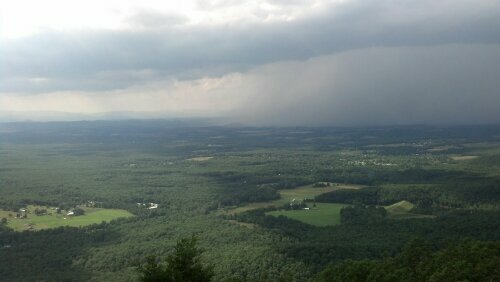 It was really neat to watch the rain moving by and it worked: we didn’t get rained on later. Of course, I didn’t see any sign of rain on the trail anywhere so I guess it was more north than it appeared. After that I started moving faster to try to get to the shelter before dark. A lot of time had already been eaten up with all the overlooks so I didn’t linger at the ones on Humpback Mountain. When I was still a few miles out from the Paul C. Wolfe Shelter, it started sprinkling off and on so now I had to beat the rain and the dark. I pulled into the shelter just before I would have really needed to turn a headlamp on to not walk straight into trees. A storm was threatening and there were at least twenty tents taking up all the space. Turned out a church group had hiked in earlier. The shelter itself was practically empty but I prefer bug netting so Huckleberry and Copperhead, who had come in right behind me, and I decided that setting up our tents partially on the trail was acceptable. I got my tent up on very unlevel ground and went into the shelter to cook dinner in case it started raining. Stretch came in shortly after and set up in the shelter. Just after I got back into my tent and started blogging, the storm showed up with heavy, heavy rain. I still haven’t re-seam sealed my tent so a few spots were dripping, and the rain was also bouncing off the ground and coming in under my rain fly. I rigged up my rain skirt on one side of the tent near my head, and some bandanas on the other, and put my rain jacket over my feet, so I am at least keeping myself and my sleeping gear dry at the moment. 22 miles today.